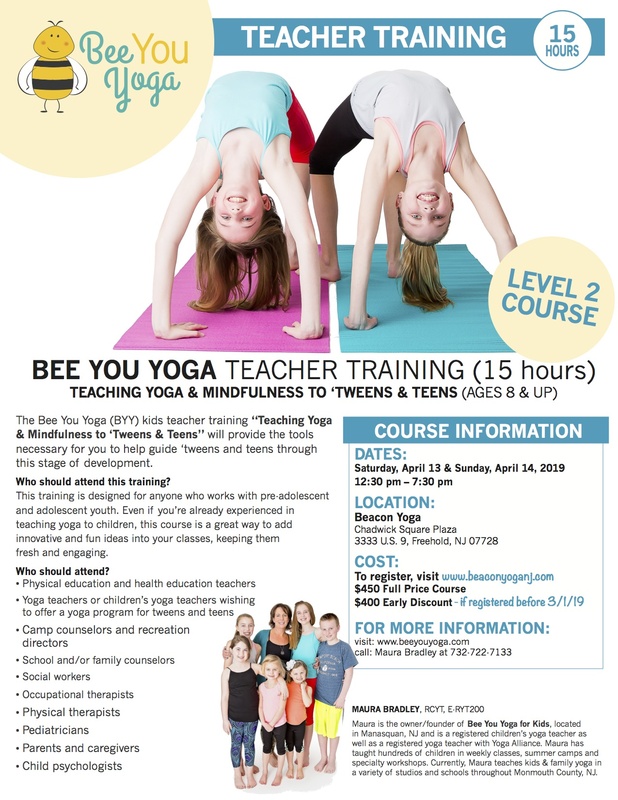 The Bee You Yoga (BYY) kids teacher training is a fun-filled, practical and engaging course that emphasizes teaching yoga and mindfulness to kids in a way that stretches their imaginations and offers them non-competitive environment where they are encouraged to "Bee Themselves." What makes the Bee You Yoga training unique is the emphasis on mindfulness and the way in which it can be incorporated into children's yoga and their everyday lives. This training is perfect for anyone that is interested in sharing the gift of yoga with kids; this includes teachers, parents, caregivers, therapists and yoga practitioners. Even if you're already experienced in teaching yoga to children, this course is a great way to add innovative and fun ideas into your classes, keeping them fresh and engaging. ​Trainees will learn how to teach yoga classes for kids ages 2-7 with age appropriate yoga poses and activities, how to create theme-based yoga classes, how to use self-calming, meditation and mindfulness techniques to help kids calm their bodies and minds. At the end of the 15 hours, trainees will be prepared to start their teaching journey and will have the opportunity to practice teach a group of children. A Bee You Yoga Foundations course certificate will be given to each participant if all sessions and the practice teaching session are successfully completed. Your course registration includes a Bee You Yoga Kids Teacher Training Manual, access to a private Bee You Yoga teachers Facebook page, listing on the Bee You Yoga website under the teachers tab and a course completion certificate. CEUs & PDUs may be available. Participants responsible for sending certificates to individual licensing boards. Let's face it, being a 'tween is hard! You are not a kid anymore and you are not quite a teenager. Similarly, being a teen is no walk in the park either! Both 'tweens and teens come to yoga class each week, like adults, with many different issues or concerns. All these situations, big or small cause stress for today's kids and coming to yoga can help alleviate some of that stress while also teaching them techniques and life skills to manage their stress. The Bee You Yoga (BYY) kids teacher training "Teaching Yoga & Mindfulness to 'Tweens & Teens" will provide the tools necessary for you to help guide 'tweens and teens through this stage of development. This training is a fun-filled, practical and engaging course that emphasizes teaching yoga and mindfulness to kids in a way that stretches their imaginations and offers them non-competitive environment where they are encouraged to "Bee Themselves." What makes the BYY training unique is the emphasis on mindfulness and the way in which it can be incorporated into children's yoga and their everyday lives. This training is designed for anyone who works with pre-adolescent and adolescent youth. Even if you're already experienced in teaching yoga to children, this course is a great way to add innovative and fun ideas into your classes, keeping them fresh and engaging. What will this training include? Trainees will learn how to teach yoga and mindfulness classes for kids ages 8 and up with age appropriate yoga poses and activities, how to create theme-based yoga classes, how to use self-calming, meditation and mindfulness techniques to help kids calm their bodies and minds. At the end of the 18 hours, trainees will be prepared to start their teaching journey sharing yoga and mindfulness with 'tweens and teens. A Bee You Yoga course certificate will be given to each participant if all sessions and the practice teaching session are successfully completed. Participants are responsible for sending certificates to individual licensing boards. Cancellations of fully paid Bee You Yoga registration will be given, less a $50 processing fee, 2 weeks or more before training. Absolutely NO refunds or credits will be issued within two weeks of training. $30 fee applies to any check returned due to non-sufficient funds. ​When paying for a training to a yoga studio other than Bee You Kids Yoga Studio, the studio's cancellation policy will apply. "I loved this class...one of the best things I have done as a parent - I went to the class to get some tips for my OT likeness and left with enhanced parenting skills! Taught locally by a local yoga Mom - Check it out !!!" "Bee You Yoga is amazing! Finley has taken taken many of her kids classes and camps and loves them also, and Maura is a gift! Such an amazing teacher, anyone thinking of taking this training should totally do it!" "We live in a fast pace world packed with stress. Our kids are just as stressed out as we are . Why not teach them yoga/life skills at an early age. This class is only one weekend!!! Maura Leddy Bradley is an amazing teacher . You should check it out." "Shout Out for my friend, Maura Leddy Bradley. I attended Maura's first Child Yoga Teacher Training. I was a budding Yogi but Maura's training was patient and free-spirited. I practiced asanas(positions) I didn't even know my body was capable of. Maura is a fun and amazing teacher. She is a true, experienced Yogi...who knows her stuff! If anyone has ever thought about working with kids in a special way...this training is for you! Teachers this is a great tool for you to share in your classrooms with students. Teaching them how to be mindful, kind and showing them how to handle life's stresses at a young age. Moms this training is a great way to bring Yoga and Mindfulness into your home and bond with with your children in a special way! Yoga and Mindfulness are amazing skill sets that will impact and change lives! Share the LOVE and learn how to teach Yoga and Mindfulness to young people everywhere!"